Comment: Could drilling require the same planning permission as Velux windows? - Unearthed Comment: Could drilling require the same planning permission as Velux windows? Comment: Could drilling require the same planning permission as Velux windows? Fracking is the future gift that – somehow – never stops giving. Since the idea first emerged that the UK could enjoy a “US style” shale boom global oil and gas prices have fallen, drilling outside the US has ground to a standstill and exactly nobody is producing any shale gas anywhere in the UK. But why let that get in the way of story about new, exciting, industry which could rebalance our economy away from the EU-dependent banking sector and back towards good old fossil fuels – which now need no more planning permission than a modification to your garden fence. “The discovery and extraction of shale gas in the United States has been a revolution,” notes the Conservative manifesto, optimistically. To whoever wrote the Tory manifesto the only problem is clearly the oppressive weight of (EU inspired) regulation, and the manifesto does a great deal to try and get rid of it. One suspects this isn’t the only area where the red-tape axe will fall. First the problem with local residents objecting to simple exploratory drilling. 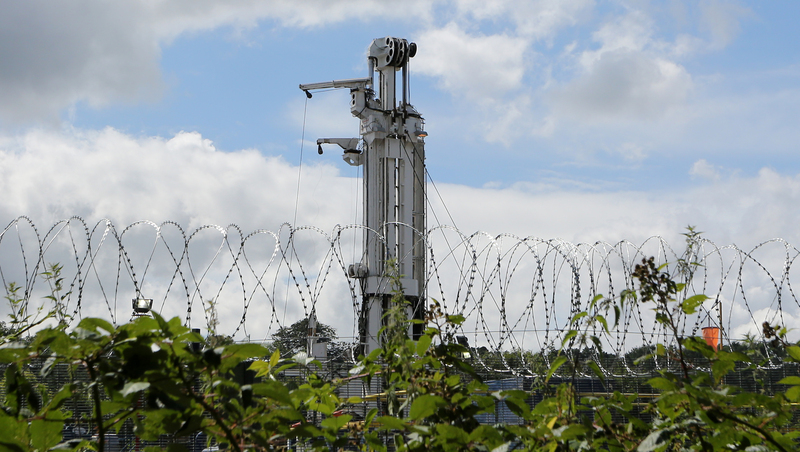 Exploratory drilling for shale gas will be subject to the same level of planning permission as a boundary wall in your back-garden, or a new window on your roof. The commitment would see firms looking to explore for shale gas or oil requiring a lower level of planning approval (none) than – say – a garden extension. “Certain minor building works don’t need planning permission. This is because the effect of such developments on neighbours or the surrounding environment is likely to be small”. If a company finds gas and wants to frack the council will – eventually – get a say. Ministers may hope their decision would be swayed both by a special new advisory body and by a pre-announced change to the Shale Wealth Fund which will allow communities – however defined – to benefit from the tax revenues from shale gas. The only flaw in the plan is that there is little evidence to suggest tax revenues from shale gas will exist at all, much less that they will outweigh possible losses to home values. In any event – it doesn’t really matter. Ministers will retain the right to make fracking schemes part of the “National Planning Regime” governing major infrastructure projects, giving them – not councils – final say on whether they happen. Which means that the only real check on fracking – apart from dysfunctional economics – comes from the health and environmental rules which all companies must follow – even if they have planning permission. Those rules are not largely about road traffic, property values, noise, views or any of the things you might reasonably worry about if a neighbour told you they were going to cancel their extension and – instead – plant a massive drilling rig in their back garden. No. Because really it’s just a little wall. But they do cover some obviously important issues. Health and safety on site and environmental protection of air and water from drilling operations and drilling companies will still have to seek clearance from a new shale gas agency before they can get going with even exploratory drilling. The only problem is we don’t know what rules that new agency will enforce. As we leave the European Union we will “take control of our environmental legislation” putting almost all existing rules governing shale gas exploration under review. That includes more than 15 EU directives and regulations, including the Water Framework Directive, REACH regulations (use of chemicals), Habitats Directive , Groundwater Directive, Mining Waste Directive, Industrial Emissions Directive, Environmental Liability Directive and the Environmental Impact Assessment Directive. Environmental impacts assessments – which slow down the planning process – could be among the first casualties. After all the UK has long lobbied against making them mandatory for shale gas projects.